A Palestinian protester shoots stones with his slingshot during clashes near the border with Israel in the east of the Gaza Strip on Tuesday. This week’s horrific violence along the Gaza border is emblematic of the chasm that exists between the two sides in the Israeli-Palestinian conflict. To listen to Israeli officials and their supporters (including the White House), the deaths of dozens of Palestinians and the injuries to thousands others is solely the fault of Hamas, the terrorist organization that governs this seemingly cursed strip of land. For pro-Palestinian voices, Israel engaged this week in a full-scale massacre of unarmed civilians peacefully protesting Israel’s policies. The truth is far more complicated and, while neither side wants to hear this, there is plenty of blame to go around. We need to first put to rest the notion that the demonstrations in Gaza were peaceful protests. They were not. 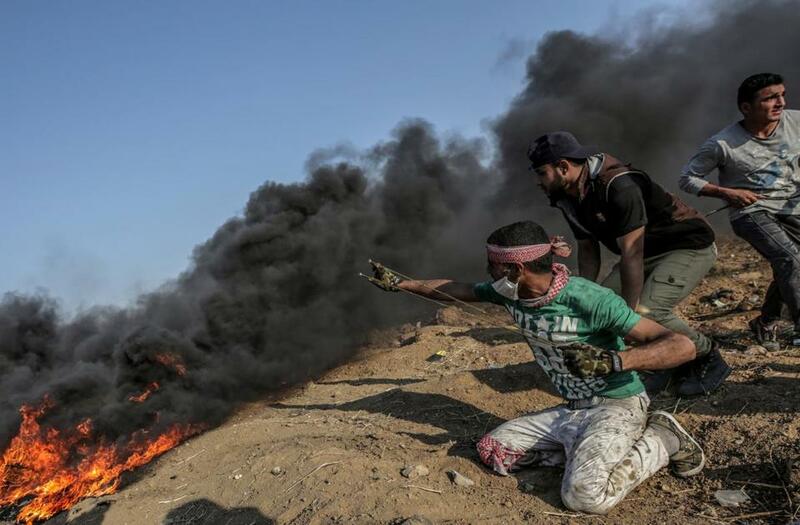 Only the willfully obtuse will ignore the numerous journalistic accounts — from those on both sides on the border — that make clear that while many of the demonstrators were peaceful, plenty of others flung Molotov cocktails, burned tires, laid IEDs, and flew kites with incendiary devices intended to set fires across the border in Israel. It’s the worst day of carnage in Gaza since Israel’s 2014 invasion. There’s been additional reporting that during the violence Hamas organizers urged protesters to burst through the border fence, claiming that Israel soldiers were fleeing their positions (they weren’t). Maps were available on Hamas’s Facebook page delineating the paths to an Israeli kibbutz near the border. Had this been a peaceful protest intended to raise awareness of Israel’s blockade of Gaza, which has contributed to a humanitarian emergency, that would be one thing. But the name of these demonstrations is the “March of the Return,” as in Palestinians returning to their homes in Israel. That name is completely consistent with what really happened this week: a clear and unambiguous effort, orchestrated and supported by Hamas, to breach the border fence, civilian casualties be damned. However, Israel’s supporters shouldn’t be patting themselves on the back for defending their country from terrorists. Everything that happened this week was inevitable, predictable, and at least in part, avoidable. As Harel points out, it’s been clear for months that Gaza’s infrastructure and economy “is in desperate straits.” Many Gazans, with no economic prospects and trapped on a crowded piece of land from which they cannot escape, feel that they have nothing to lose. Still, Israel has taken no concrete steps to alleviate their deprivation. If anything, the Israeli blockade of Gaza has become more not less capricious. It’s also clear that Hamas is under enormous political pressure — not just from Israel, but also from Egypt and the Palestinian Authority, with whom it’s locked in a bitter political struggle. The terrorist group frequently falls back on “resistance” tactics against Israel as a way of improving its political standing among Palestinians. Yet Israel rejected recent feelers put out by Hamas for a ceasefire. That the group would eventually try to provoke a military response from Israel was practically pre-ordained. Israel’s supporters will argue that the crippling blockade they’ve imposed on Gaza is necessary because Hamas has shown over and over again that it will take any opportunity to use Gaza as a staging ground for attacks into Israel. And they’re not wrong. Even after the devastating 2014 Israeli war in Gaza, Hamas continued to build tunnels under the border for use in attacking Israel. Anyone who argues that Hamas can be trusted to do the right thing if Israel were to weaken its siege of Gaza is fooling themselves. But that doesn’t mean Israel can wash its hands of the territory’s plight and pretend that its policies are not contributing to the sense of hopelessness among Palestinians and the inevitable, subsequent outbreaks of violence. Moreover, if there were nonviolent ways to stop breaches of the border fence, Israel clearly did not use them. Reliance on live fire, even if intended to wound, will inevitably kill far more people than just the intended targets. It’s hard to believe that Israel couldn’t have developed non-violent tactics for quelling the protests or perhaps could have devoted greater resources to strengthening the border fence and thus making it more difficult to approach and potentially breach. Israelis like to take the position that if Hamas continues to provoke Israel (as it has), their soldiers have little choice but to respond with deadly force. That is, to say the least, a morally dubious position and and one that no democratic country should adopt. Finally, although the opening of the US Embassy in Jerusalem this week was not the direct cause of the violence, it did not help. The Israeli government knew this, and its indifference to the juxtaposition of celebrating the embassy opening while Palestinians were being struck down in Gaza is hard to fathom. Israeli government officials may not care — and one could cynically argue that Prime Minister Netanyahu benefits politically from the violence — but as usual they have put their supporters, particularly American Jews, in the position of defending the indefensible. When you combine the Gaza violence and the Israeli government’s hosting of a gaudy embassy opening (which feted a president and a group of evangelical pastors who are anathema to American Jews), it’s hard to see much evidence that Netanyahu cares about how his policies are alienating Diaspora Jews — and further isolating Israel. There are no easy answers to the problems in Gaza today. As long as Hamas adopts a policy of complete rejection toward Israel and continues to use violence as a political tool, there is little hope for improving the increasingly desperate humanitarian situation in Gaza. But at the same time, as long as the right-wing government in Jerusalem does nothing to alleviate the suffering in Gaza, and views the periodic outbreaks of violence as a domestic political plus, more violence, bloodshed, and tragedy is inevitable. Both sides are to blame; both sides need to find an exit ramp from the current situation, and neither seems inclined to do so.